Event: "Vincent" - One-Man Play by Leonard Nimoy | Patchogue Arts Council, Inc.
Don’t miss this first-ever Co-Production with The Patchogue Theatre for the Performing Arts! Our first event of the Artful Antics season takes place on April 11-13 at the Patchogue Theatre (PTPA) with a multi-disciplinary performance of Leonard Nimoy’s play “Vincent’s Letters to Theo”, the first ever co-production of its’ kind by PAC & PTPA. While Van Gogh is sometimes associated with a sense of gloom due to his many challenges which are well-known; he found joy through painting and that emotion, expressed in his work, still resonates and creates joy in the viewer. 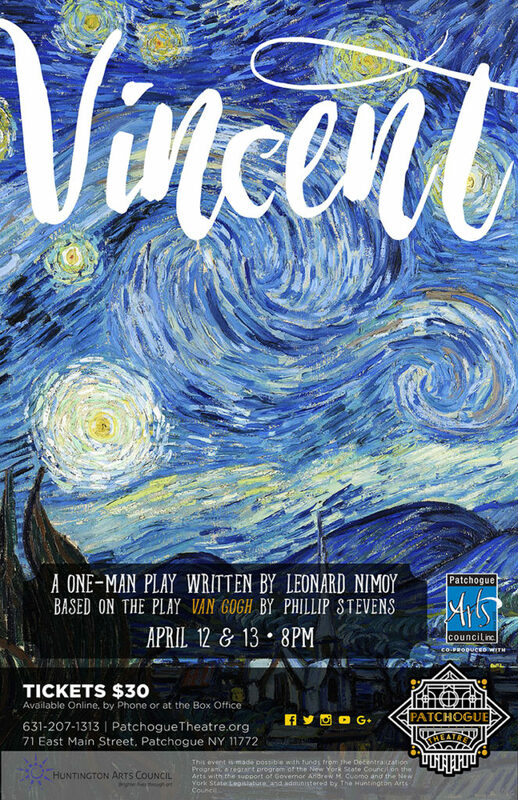 This one-man play, written by Emmy nominated actor Leonard Nimoy, explores the little known side to Vincent van Gogh. The world-renowned artist only grew to his fame after his death in 1890. Much of his personal life was left misunderstood as he was seen by the masses as an obscure kind of genius. For many years, we wrote letters back and forth with his brother, Theo, revealing the struggles and thoughts behind some of his most famous works. The play takes place after Vincent’s death as Theo recollects these letters and speaks about him to a gathering of peers. In this intimate production, we are transported to this gathering as if we are hearing about Vincent in an all-new light for the very first time. Vincent will provide a multimedia experience by beautifully displaying Van Gogh’s works on stage through projection as Theo talks about them, allowing you to view these paintings and drawings while listening to their fascinating backstories. This production is bound to peak your curiosity about one of the world’s most renowned artists and offer a brand new perspective on his works. This production will be open to school groups to attend at a discounted rate on Thursday, April 11 and Friday, April 12 at 10 a.m. Talkbacks and curriculum guides will be available to participating schools as well.